I recently finished a book called Julie and Julia: My Year of Cooking Dangerously. It was written by a woman named Julie Powell (Amherst graduate, holler) who gave herself one year to make every single recipe in Julia Child’s Mastering the Art of French Cooking, Volume 1. Just so we’re clear, that’s 524 recipes. In 365 days. I won’t ruin the book by telling you exactly what happens to Ms. Powell over the course of the year, but I will say that the result of such an ambitious project involves aspic, sautéed kidneys, bone marrow sauce… and Potage Parmentier. Because it is. Délicieux! And, most importantly, it’s easy. Julia Child herself called Potage Parmentier “simplicity itself to make.” Amen to that, JC. All it takes is some peeling and chopping, and then everything gets thrown into a big pot (and if you have a roommate like mine who is an expert potato peeler, all the better). We made the Potageon Saturday, before Andy, Alyssa, and Sadie came over for dinner. At first, peeling and chopping and boiling away, I was excited. So quick! So easy! I even threw a rind of parmesan cheese into the simmering pot to liven up the soup’s flavor. But then, after some immersion blending, I started to doubt myself. The puréed soup looked unappetizing. The color was a light-yellowish-beige, and the whole thing smelled less than slurp-worthy. It just seemed sort of… eh. I needn’t have worried. My brave dinner guests took hot bowls of soup, topped with a splash of cream, crispy pancetta, and fresh chives, and sat down at the table. After many precautionary announcements detailing the quickness with which I could get pizza delivered, if necessary, we all picked up our spoons. (which should really be called “death by chocolate cookies,” but that’s a whole other post), I’m surprised I didn’t black out entirely. In any case, it seems I was able to snap only a few blurry photos of the evening. Mostly empty bowls, as it turns out. Well played, Mrs. Childs… well played. Though it doesn’t call for many ingredients, this soup is hearty and filling. To cut the richness, you could omit adding the cream at the end (though, really, this wouldn’t be something I endorse). The parmesan rind adds a round nuttiness to the flavor of the soup, which pairs nicely with the topping of crisp, smoky pancetta. If I had a food mill, I’d use it instead of a blender to purée the Potage. The result would be a slightly thicker-textured soup, which I prefer. But, to each her own – purée away, if you’re so inclined (or if your kitchen lacks certain food milling appliances). Either way, reheated leftovers make deliciously satisfying lunches and weeknight dinners. Even without leftover chocolate cookies for dessert. Combine the potatoes, leeks, and onions in a large stock pot. Add chicken stock (or water) to cover the veggies with an extra inch or two of liquid. Add the salt, cover, and bring to a boil. Lower the heat to bring the mixture to a simmer, and add the parmesan cheese rind. Simmer, covered, for 40-50 minutes. Remove the parmesan rind from the soup (it will be very soft and melty), and let the mixture cool slightly before puréeing to desired texture (using an immersion blender, regular blender or evasive food mill). Add more salt and some pepper to taste. Reheat over a low flame until ready to serve. While the soup is reheating, toss the chopped pancetta in a large frying pan and sautée until crispy. Drain over paper towels. Off the heat and just before serving, stir in cream by spoonfuls (I let my dinner-mates add the cream to their own bowls – it’s fun and doesn’t let you under- or overdo it). Top with some crisp pancetta and chives. Slurps, I mean, serves 6-8. First, no one did Julia Child like John Belushi. 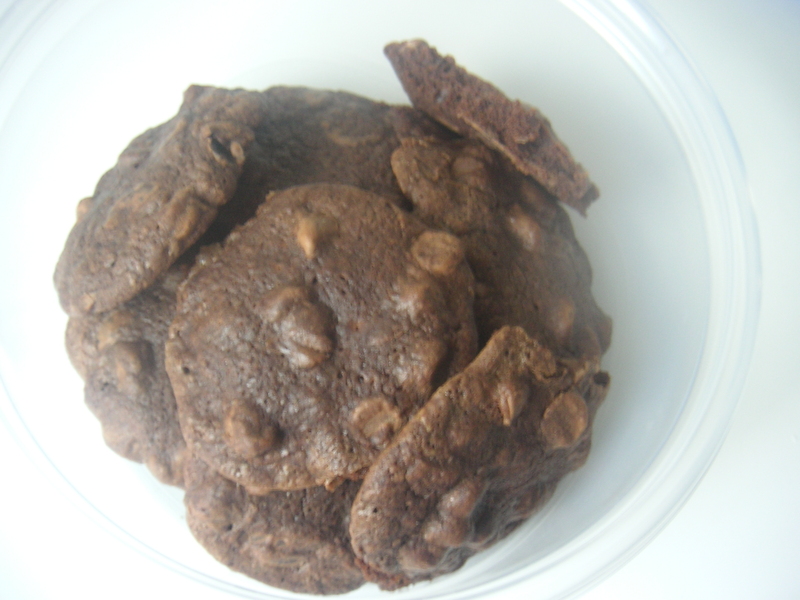 And, second, are there any death by chocolate cookies left?